Trim out your space with Crown Molding MXF™ from diamondLife™. Crown Molding MXF™ features heavy duty all aluminum construction and is available in 4 ft and 8 ft lengths as well as custom sizes. 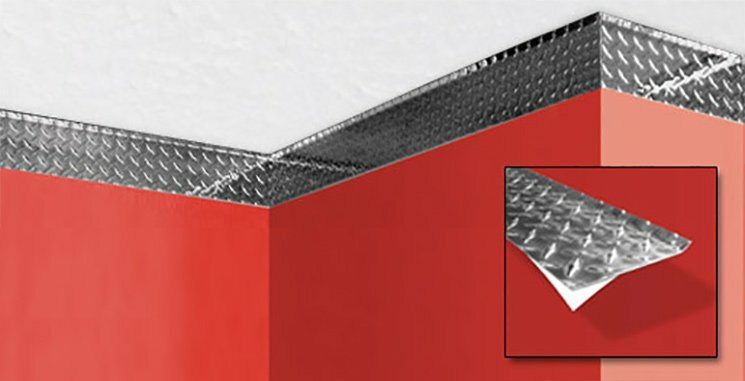 Pre-formed inside and outside corners eliminate miter cuts making installation even easier. Installing Crown Molding MXF™ has tremendous "bang for the buck" and completes any room. The use of crown molding has been a long standing architectural technique to smoothen the transition from the wall to the ceiling. Stunning metals make our crown moldings look like jewelry on the walls. Why pay similar prices for wood moldings when you can have real commercial grade metal? You’ll smile every time you walk into the room. Crown Molding MXF™ installs easily using a construction adhesive, such as Liquid Nails™. Available in 4 ft and 8 ft lengths as well as custom sizes. Use for industry, factory, office, retail spaces, workshop, garages and more. Looks great, works even better™. Such an excellent and sharp look for a weight room. Thanks Again. I would recommend diamondLife to anyone. Recommended for commercial installations instead of our self-adhering feature. Why? We'll cut to the size you need! Just call us and tell us you want a Custom Cut, and we'll cut your Crown Moldings to the length you specify. Our Live Support at 1.888.98.DGEAR is available 8:00am-4:30pm EST M-F to take your Custom Cut order. Sorry no returns on Custom Cuts. Not sure which metal to get? Order our FREE Metal Swatches! Our Metal Swatches are actual 2"x3" samples - so you can see, touch, & feel the real thing. Your first 5 swatches are free and have free shipping.